Boone Central’s inexperienced 2010-11 wrestling team again saw positives offset by what Coach Dale Bonge termed “growing pains” in action this past week. The Cardinals lost eight of 10 contested matches in a dual vs. O’Neill Thursday, then finished 9th of 11 teams in tournament action at Gibbon Saturday. The Cardinals will continue their season Friday in the Madison Invitational (1 p.m.). A strong O’Neill squad dominated action in Albion Jan. 13, scoring a 55-24 victory over Boone Central on the strength of six pins. Freshmen Jackson Meyer (103) and Skyler Weber (125) scored BC’s victories on the mat and the Cards also received two open weight forfeits. “More and more of our team is getting in a pattern of doing something good, followed by a costly error, often resulting in a pin for the other team,” commented Bonge. “That is a common trait of inexperienced wrestlers going through growing pains. It also shows we are continuing to exhibit signs of improvement. Both Meyer and Weber notched pins for their victories. Meyer stuck Joe Gillham in 5:46 and Weber put away Dion Nemec in 3:11. Boone Central finished 9th in the team standings of the Gibbon Wrestling Tournament Jan. 15, but brought home four individual medals that included a pair of third-place efforts. Although the 9th place finish might not look impressive on the surface, BC Coach Dale Bonge noted that the Cardinals were in the thick of scoring with the majority of teams competing. 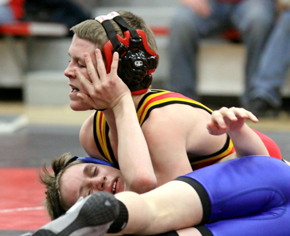 Boone Central was led by Jon Christo and Bobby Stopak, who both earned third-place finishes. Jackson and Jacob Meyer each took fourth in the competition. “Jon had his best performance of the season, going 3-1 with two pins and a hard-earned 5-4 decision for third. For that, he was our wrestler of the meet,” Bonge commented. “Bobby also had two pins. His only loss was to the defending state champion from Wood River.